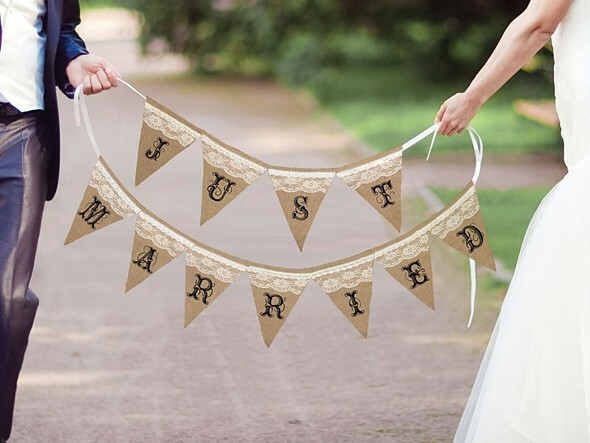 This burlap "Just Married" pennant banner features lace detail and black lettering and it will make a beautiful addition to your rustic wedding reception's decorations. add elegance to the banner. PLEASE NOTE: ALL SALES ARE FINAL ON THIS CLEARANCE ITEM. "You've really got a great selection of personalized wedding favors. I needed something for my bridesmaids and found the perfect bridal favors idea on your website. Thanks for offering so many choices in an easy shopping website." Rita S.